As night fell Monday, demonstrators returned to West Florissant Avenue in Ferguson to resume their vigil after Sunday night’s police-involved shooting. For several hours, things were calm. People marched up and down West Florissant. Some danced to the drum circles and other chanted slogans. But around 10 p.m. tensions began to flare. St. Louis County Police tweeted that people were throwing frozen water bottles at them. The police, who were out in riot gear, gave warnings for the crowds to disperse. They used pepper spray on several protesters and arrested those who didn’t cooperate. 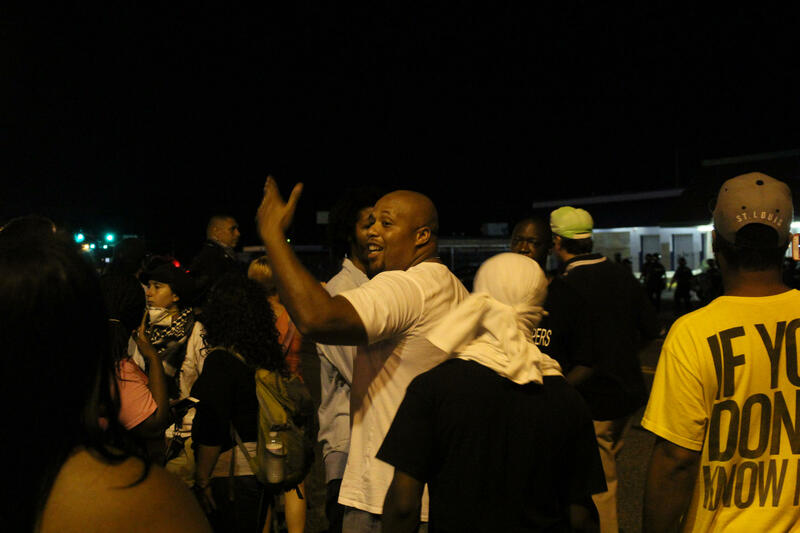 Throughout the night, the tension alternated between wary calm with about a hundred protesters and several dozen media walking the sidewalk on one side of West Florissant while the police remained on the other side. The evening was reminiscent of last August. Every now and then, individuals in the crowd would throw something at the police or the police would warn people to get out of the street and police would advance on the protesters, arresting some and dispersing the crowd further. Protester Rnesha Baldwin, 32, said the evening's tension and arrests resulted from police inability to control their emotions. "They've learned to contain themselves, but they haven't learned to control their facial expressions, control their bodies," she said. According to Baldwin, who has been at protests since August of last year, police reaction to crowd's chanting, shouts and vocal challenges appears directed by emotion. "It's peaceful out here, we might be a little annoying, but it's peaceful," said Baldwin. Other protesters were more committed to voicing their frustration with police. Sammy Reece, 23, took to the street despite police instruction that protesters remain on the sidewalk. "I love my justice. I love my peace. They want to take it away, and we’re going to keep on screaming,” he said of his actions. By 12:15 a.m. on Tuesday, police reported that 23 people were arrested. There were no reports of shootings, burglaries, lootings, property damage, or injuries to civilians or police, according to a police statement. "The St. Louis County Tactical Operations Unit was on standby for protest support, but was never deployed to actively participate with any civil disobedience," the statement said. "At no time was any smoke or tear gas used. St. Louis County Police provided extra patrols throughout the City of Ferguson to provide safety to both businesses and citizens." Occasionally, members of the media were targeted by police. St. Louis Post Dispatch reporter Robert Cohen was pepper sprayed by police. And Huffington Post reporter Ryan Reilly had to defend himself to the police who mistook him for a protester. 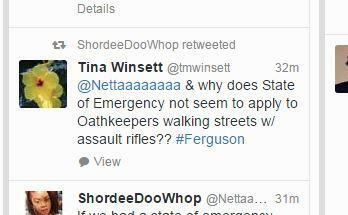 After midnight, a group of five white men who call themselves the Oathkeepers arrived on the scene. They carried assault weapons which raised alarm from protesters. 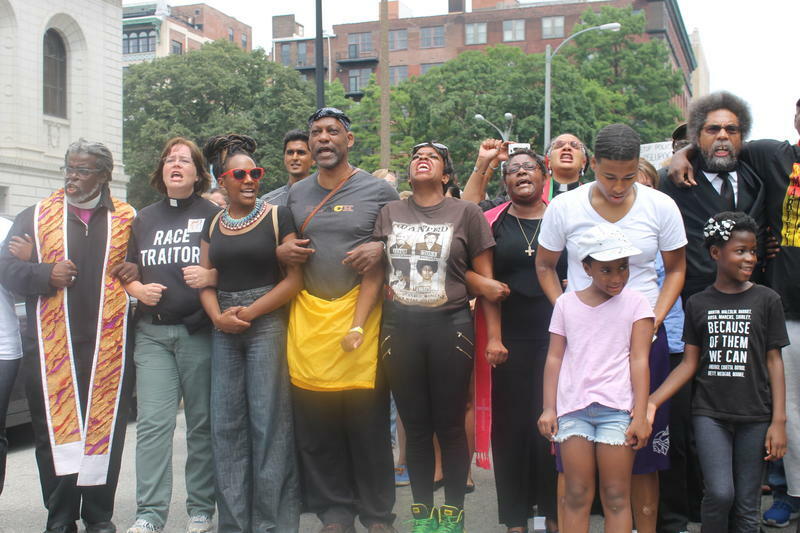 Sunday was the first time Erica Garner stepped foot in Ferguson. She’s the daughter of Eric Garner, a man who was choked to death by a New York police officer. 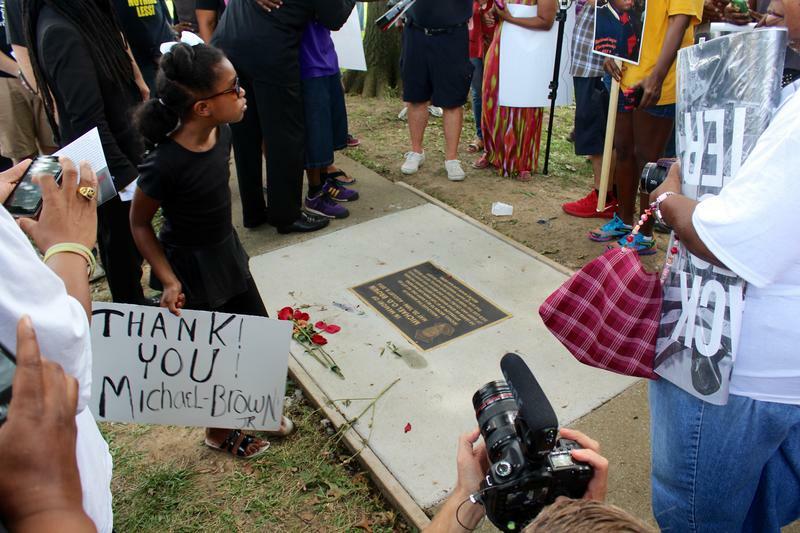 She ventured to the St. Louis region to pay tribute to Michael Brown, the 18-year-old who became a symbol for a growing movement to change policing. After a Sunday night marked by violence in Ferguson, Monday brought with it an emergency declaration in St. Louis County, dozens arrested at a protest at the federal courthouse, comments from U.S. Attorney General Loretta Lynch and a temporary shut-down of Interstate 70. 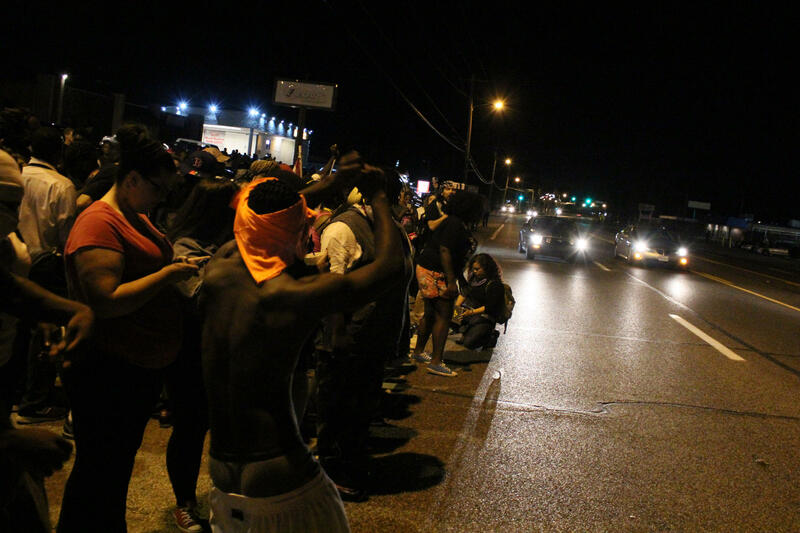 Monday night, some were arrested in Ferguson but there was no gunfire or property damage. 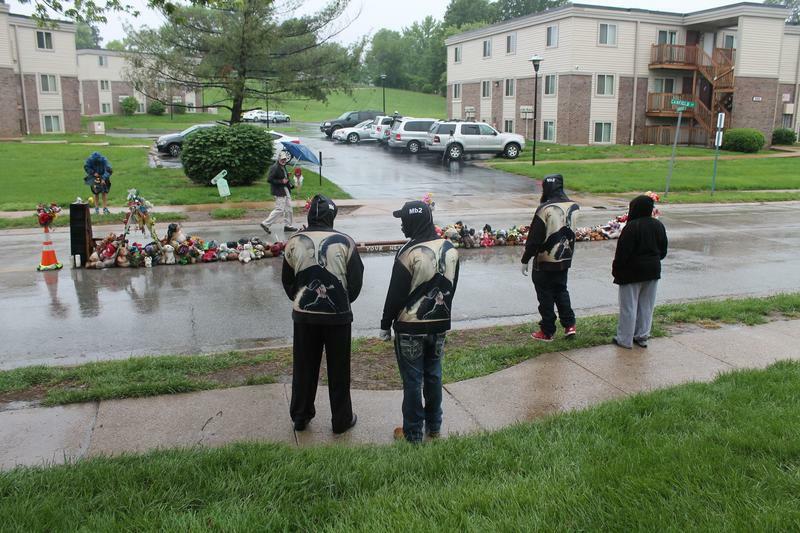 Sunday, August 9 marked the one-year anniversary of both Michael Brown’s death and the birth of movements that drew attention to racial bias and policing in America. “St. Louis on the Air” immediately tangled with those complex issues, discussing social justice, political protest, and police brutality with its guests. The show has continued to steep itself in those issues over the past year.